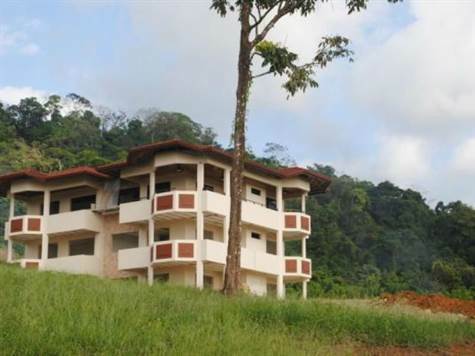 Costa Rica Golf Course Villa for Sale This one bedroom Costa Rica golf course condominium for sale south of Dominical and Uvita features a master suite, full bathroom, Kitchen, and living areas. Ocean view, fully furnished and close to all the amenities. Located in the Costa Ballena Region and minutes away to some of the most beautiful beaches in Costa Rica, the newly opened Coastal Highway, new hospital, two regional airports and the proposed international airport... you can see why this is one of the hottest investments in Costa Rica. With the first phase under construction and a the 2- bdrm. Model Condo Unit just finished, this is a great time to invest in the first Costa Rica golf resort in the South Pacific! The HOA for the Condos are as followed: $200 USD/month for the maintenance of the resort/pools/roads and gardens. In case of buying a lot, $150 USD/month. The Golf Course has 9 holes currently open for play at a public rate of $25. This course will surely become one of the better in all of Costa Rica with a challenging, inviting and picturesque layout.